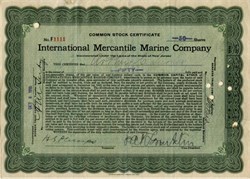 Beautiful certificate from the International Mercantile Marine Signed by Franklin issued in 1915. This historic document was printed by the American Bank Note Company and has an ornate border around it with a vignette of the company name. This item has the original signatures of the Company's V. President, Philip Albright Small Franklin and Secretary, and is over 98 years old. Philip Albright Small Franklin (1871�1939) was president and chairman of International Mercantile Marine Company (IMM) from 1916 to 1936. At the time of the Titanic disaster on April 15, 1912, Franklin was in charge of the White Star Line office and terminus affairs at IMM headquarters in New York City. At the time of the Titanic disaster on April 15, 1912, Franklin was in charge of the White Star Line office and terminus affairs at IMM headquarters in New York City. Upon hearing about the ship's sinking via wireless messages, he did not at first assume the worst, saying in a statement to worried relatives and friends of the ship's ill-fated passengers and press reporters crowding outside the White Star Line offices at around 10:30 PM that night, "There is no danger that Titanic will sink. The boat is unsinkable, and nothing but inconvenience will be suffered by the passengers." Later, at about 11:30, he insisted, "We hope that reports from the Virginian and the Parisian will prove to be true, and that they will turn up with some of the passengers (other than those already aboard the Cunard liner Carpathia)." But, by midnight, Franklin admitted the seriousness of the situation, saying in a statement, "I thought her unsinkable, and I based my opinion on the best expert advice. I do not understand it." Nevertheless, his competent handling of the public relations crisis in New York at the time earned him praise from the directors of IMM, and was later promoted in due course as J. Bruce Ismay had fallen out of favor due to the latter's controversial association with the lost ship. Ismay had, at one point, been considered for the presidency of IMM before the Titanic disaster.